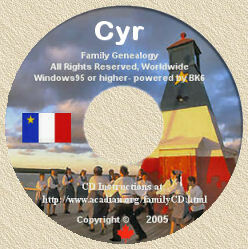 Acadian Genealogy Homepage; The Land of Evangeline and Grand Pré! Adjacent to the town of Wolfville Nova Scotia, is Grand Pré (or 'Great Meadow'), which stretches east from the Acadian dykes that exclude the tides of Minas Basin. The story of Grand-Pré and of the fictional character Evangeline", is an interesting one filled with history and courage. Throughout this region of Nova Scotia, one is reminded of the story of the tragic "Expulsion of the Acadians". The settling of Grand Pré began in 1680, when two families discovered the area during their search for serenity from perils which in that year threatened Port Royal. For fourteen years, they prospered in this sheltered and beautiful countryside. Everyone in the village worked together and engineered the complex system of dykes along the shores of the Minas Basin, reclaiming the level lowlands from the tides into what is today the agricultural heartland of Nova Scotia. The French population of Grand Pré increased and there soon became more Acadians there, than English at Annapolis. French disturbances arose between France and England and in 1745 Louisbourg fell to New England troops. In a few years the French arrived and on September 5, 1755, the heads of Acadian families gathered in the church of St. Charles in Grand Pré. They were advised that their families were to be deported and their lands confiscated by the English. In the end, it became impossible to keep families together. This event was immortalized by the American poet Henry Wadsworth Longfellow, when he wrote his epic poen "Evangeline". 1997 marked the 150th anniversary of this poem. In this tale of lovers, Evangeline is separated from her betrothed Gabriel, because of the Acadian expulsion of 1755. A beautiful bronze statue of the fictional Evangeline, symbolizes the tragedy of the Deportation at the Grand Pré National Historic Site, which Judy and I had occasion to visit in 1997.